InteraXon has developed its own consumer grade EEG brain-to-computer interface, and is looking for applications. InteraXon is based on Toronto, so naturally the idea of mind-control Olympics came up. 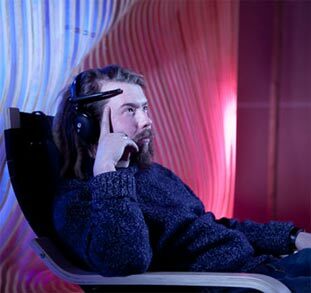 When visitors to the Ontario Pavilion next month put on the headphone-like brainwave sensors, their mental activity will be communicated to control systems that light up each of the sites. Slow your mind and the lights dim as the brain starts producing lower-frequency alpha waves. Higher-frequency beta waves of an alert mind make the lights come to life – comet trails stream down the shaft of the CN Tower; backlit Niagara Falls starts to glow in shades of purple and red; Parliament Hill springs out of the shadows. Watch the first few seconds of this informative video for a good science fiction reference. Update: Thanks to Moira, here's a quick video that summarizes The Game from Star Trek: The Next Generation.